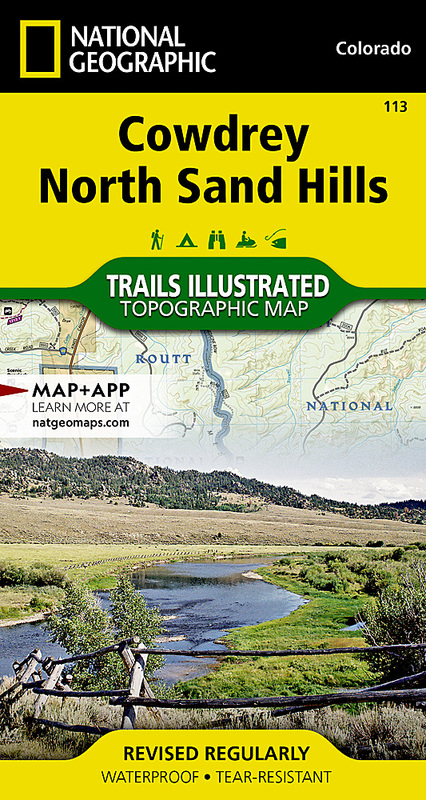 Enjoy the abundant recreational opportunities in northern Colorado with the help of National Geographic's Trails Illustrated map of Cowdrey and North Sand Hills. Expertly researched and created in cooperation with the U.S. Forest Service, Bureau of Land Management, Colorado State Parks and others, the map will guide you off the beaten path and back on again with unparalleled detail of the area. Coverage includes popular recreation spots, such as Roosevelt and Routt National Forests; Platte River and Rawah Wilderness areas; Lake John, Richard, Cowdrey Lake and Diamond J State Wildlife Areas; State Forest State Park; Medicine Bow Mountains; and North Platte River. Mapped trails, Forest Service roads and BLM routes are marked for hiking, road or mountain bike, snowmobile, OHV or motorized use. To aid in your navigation, the map also includes contour lines, elevations, labeled peaks, summits and passes, water features, areas of wooded cover, selected waypoints and clear color-coded boundaries between different land management agencies. Some additional recreation features pinpointed are campgrounds, picnic areas, river access points, boat launches, fishing areas, RV dump stations and wildlife viewing. Additionally, wilderness regulations, survival tips, Leave No Trace guidelines and essential contact information is provided. Other features found on this map include: Independence Mountain, Lake John, Medicine Bow Mountains, Rawah Wilderness, Roosevelt National Forest, Routt National Forest.